Euro-Americans had expected American Indians to become extinct as the United States expanded westward. By the 1850s, photographs documenting the so-called vanishing race were highly valued. These photographs emphasized surface details—the contours of a face, the intricacies of dress, the arrangement of hair. With its hard, clear lines, the silver print was ideal for communicating this precise visual data. At the end of the nineteenth century, however, art photographers traded photographic precision for artistic interpretation. 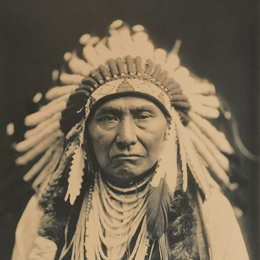 Chief among them was Edward S. Curtis. 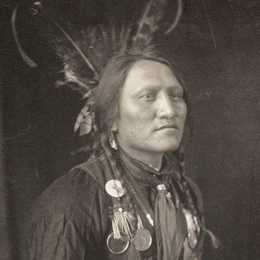 In the introduction to his monumental twenty-volume The North American Indian (1907–30), he rejected what he called photography’s “microscopic detail” in exchange for a more “luminous picture” of Indian life. The platinum prints made by Curtis and others conceptualized the idea of the vanishing race in visually unprecedented and troublingly romantic terms. 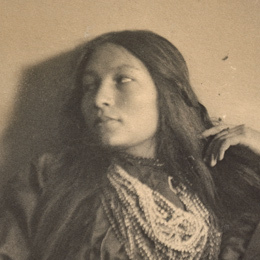 Disarmingly beautiful and still widely admired, these photographs continue to mask a catastrophic moment in American Indian history. Using their platinum print photographs, Larry McNeil and Will Wilson challenge this history and its legacy.